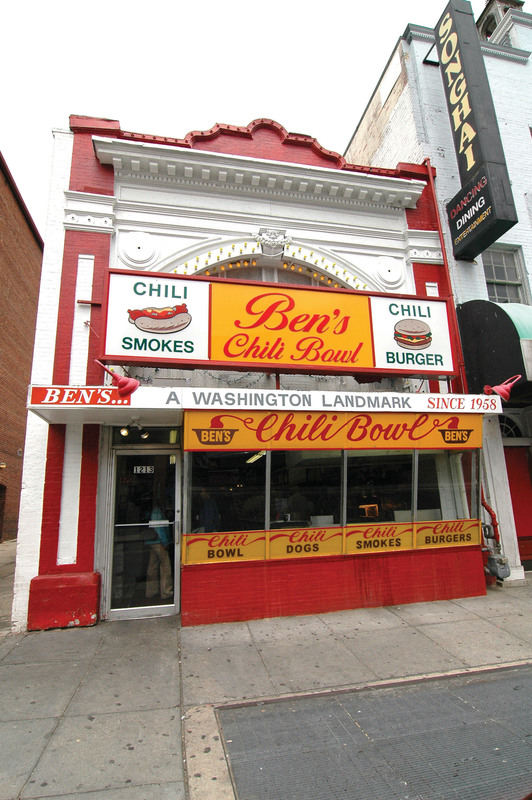 WASHINGTON (April 26, 2007) -- In 1958, Ben Ali and Virginia Ali opened Ben's Chili Bowl restaurant on U Street NW. Now just short of its 50th anniversary, the restaurant, known best for its half-smoke with chili, is a D.C. landmark and destination for tourists from all over the country. Through the ups and downs of the Shaw neighborhood it resides in -- race riots, crime, and the construction of a new Metro station there -- Ben's Chili Bowl has endured. Today, Shaw is a revitalized, eclectic, diverse neighborhood. And when visitors to the area exit the Metro station there, one of the first things they see is Ben's. Ben's Chili Bowl on U Street NW in Washington, D.C., has been in operation since 1958. 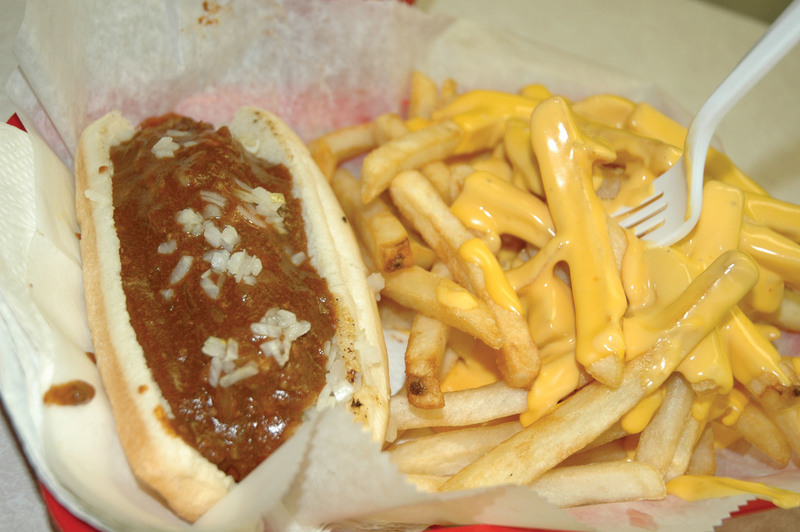 The restaurant is famous locally for its chili dogs, chili half-smokes, chili burgers and cheese fries. In recent years, it has become a popular destination for tourists visiting the nation's capitol. While Ben and Virginia have now retired, their two sons, Kamal "Ben Jr." Ali and Nizam Ali, run the family business -- though Virginia regularly shows up behind the counter to visit with customers. The menu at the restaurant is anchored by it's three classic "core" items: the chili dog, the chili half-smoke and the chili burger. Like Ben's, the "half-smoke" is itself a D.C. thing. The tasty sausage, half beef and half pork, in a natural casing, is seldom found outside the D.C., metro area, said Kamal. "The chili half-smoke is a signature item from the standpoint of that it is unique to Washington," he said. "When they do some surveys and ask what's the signature dish of Washington, D.C., they came up with the chili half-smoke. If you go to New York City, or any other city in America, you won't find it." Customers at Ben's Chile Bowl in Washington D.C. include D.C. government workers, business professionals, families, and even some celebrities. The restaurant has been in operation since 1958 and is famous for its chili half-smoke. He does concede, however, that the half-smoke has established itself in several corners of Baltimore. The most popular dishes with regular customers, by far, are the chili half-smokes, the cheese fries and the shakes. Kamal said it's easy to pick out newcomers or tourists by what they order. "We kind of know who the tourists are when they come in here and order a bowl of chili, because they notice the name is 'Ben's Chili Bowl,'" he said. "But we're not famous for the bowls of chili. We're famous for the chili dog, chili smokes and the chili burger." 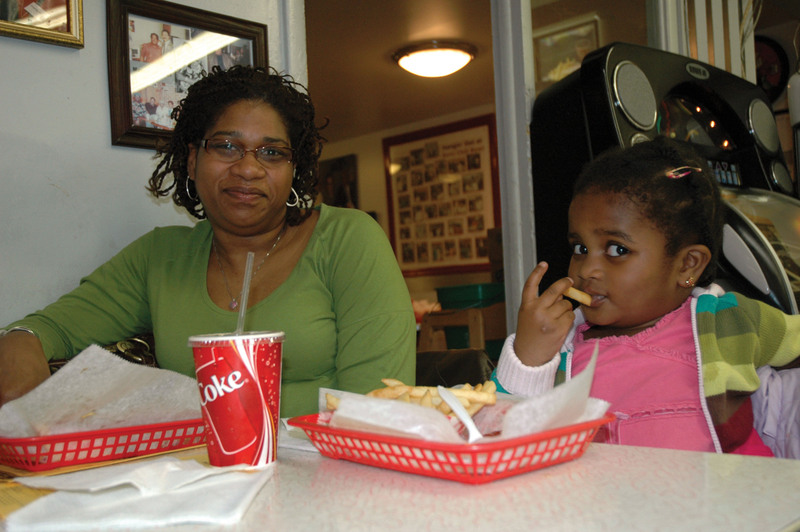 Gwen Jones and daughter Mickayla enjoy the chili half-smoke and the cheese fries at Ben's Chili Bowl, a Washington D.C. "landmark" since 1958. Terri Johnson, a D.C. resident and professional accountant, has been coming to Ben's for most of her life. "I been coming for about 15 or 20 years now," she said. "It's a long time, a very long time. But growing up in Washington, D.C., you know Ben's Chili Bowl." Johnson's friend, Gwen Jones, a project manager for a local phone company, was also eating the half-smoke. She brought her daughter, Mickayla, who enjoys the french fries. Helen Tesfamichael, an employee of Ben's Chili Bowl in Washington D.C. for one year now, serves up an order of cheese fries and a chili half-smoke. "This is a friendly community establishment that's been around for years," Jones said. "And my husband loves this place too, so we come here a lot." Jones said she's seen several celebrities at Ben's over the years, including Malcolm-Jamal Warner, former D.C. mayor Anthony Williams and former D.C. mayor Marion Barry. One of the most famous celebrities to regularly come to Ben's, and perhaps its biggest advocate, is comedian Bill Cosby, who would bring his wife Camille in on dates in the early 1960s, Kamal said. An order of cheese fries and a chili half-smoke at Ben's Chili Bowl in Washington D.C.
"Everybody knows Bill Cosby, he's our best spokesman. It's like he works here, he shows up, puts his apron on, and entertains the crowd," he said. Celebrities aside, Kamal said the customer base at the Chili Bowl is very diverse, perhaps due to its location atop a Metro station and it's late operating hours. "We get D.C. government workers here and dignitaries, as well as the party crowd late at night after the clubs are out," he said. "We also get the tourists and the families -- we get a little bit of everybody, a cross section of Washington." 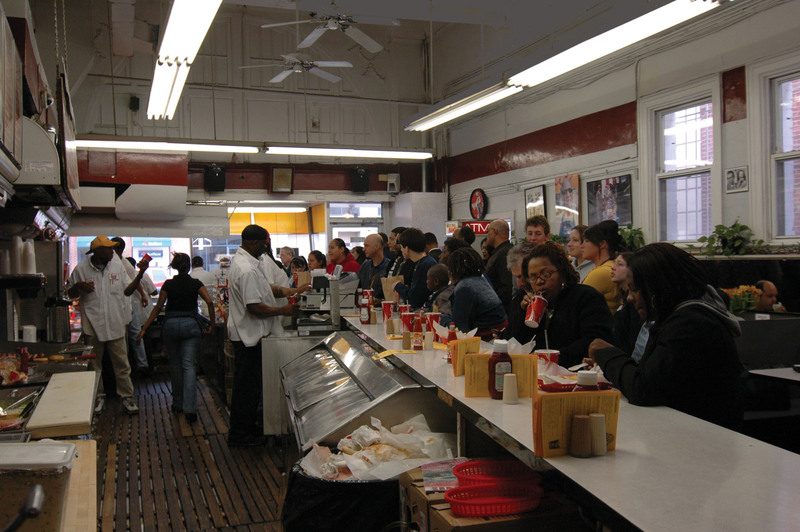 Ben's Chili Bowl hasn't changed much over the years. The Formica countertops, the stools and the other decor is largely the same as it was in the 1950s. The menu hasn't changed much either -- it still revolves around the key menu items, though Kamal did add breakfast to the menu about 15 years ago, as well as vegetarian chili. He says the vegetarian chili looks and tastes the same as the regular chili. Perhaps the reluctance to change too quickly is one of the keys to the restaurants success, though Kamal said it's got something to do with the personality of the location. "I think this place in particular, there is some magic to this location," he said. "I don't think I could duplicate this business across the street. There is some magic to the grease on the walls, the old Formica countertops, and the stools." Ben's Chili Bowl is located at 1213 U St. NW in Washington, above the U Street⁄African-Amer Civil War Memorial⁄Cardozo Metro station. They stay open late: 2 a.m. during the week, and 4 a.m. on Fridays and Saturdays. Sundays they are open 11 a.m. to 8 p.m.